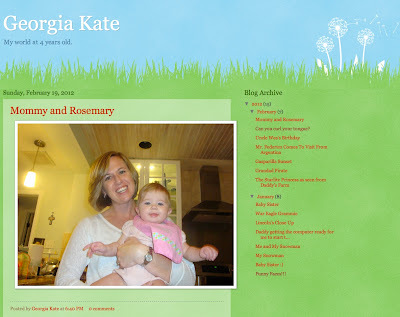 When Georgia got a camera for Christmas, Larry had the thought that he'd set up a blog for her as a place to highlight all the pictures she's taking. So- here it is!! Life from the perspective of a 4-and-a-half-year old! She only posts pictures she has taken herself, and it's funny to see what she captures. Of course, this is only a fraction of her photo gallery. She has definitely inherited her mommy's shutter-bug-ness! We have a ton of pictures of blurry Lincoln, her special rocks, her taking pictures of herself... ;) She's a natural! And she loves putting the pictures on "her website"! Enjoy!! Georgia Kate- My world at 4 years old.